Beachfront! Panoramic TOP FLOOR views! Affordable luxury at Island Princess 704! Have you ever closed your eyes and dreamed that you could feel the sand under your feet, the sunshine on your face and hear the sound of the waves coming ashore? If so, that dream is now within your reach. Come enjoy our white sandy beaches and our emerald green waters. In the heart of Okaloosa Island sits the crown jewel, Island Princess. This luxurious gulf front condo complex offers spectacular beach views and comfort at family-friendly prices. Enjoy your days by working out in the gym, cooling off in the gulf front pool, wash your cares away in the hot tub or use the outdoor BBQ area to prepare a delightful meal. This Newer 7th Floor Penthouse unit was recently remodeled to include granite counter tops, new cabinets, fresh paint and flat screen TVs in every room. The condo features two full bedrooms and bathrooms with comfortable bedding and a new sleeper sofa. The unit is equipped with everything you need to make your next family vacation the best ever, with all the comforts of home directly on the sparkling emerald waters and the sugary white beaches of Okaloosa Island. Enjoy the spectacular unobstructed views the from living room, dining area, kitchen and master bedroom suite. Watch the sun set from the spacious gulf-front balcony or wake up with the sunrise to catch some rays or watch the dolphins go by each morning as you enjoy your morning coffee. The lovely master suite has a king size bed with a large flat screen television and sliding doors to access the balcony. The master bathroom features a tub/shower combo and a beautiful vanity with a granite counter top. The second bedroom at the front of the unit, features a comfortable queen size bed, a flat screen television access to the second bathroom. The spacious living room offers plenty of seating for everyone, a comfortable queen size sleeper sofa for additional guests and large flat screen television for everyone’s viewing enjoyment. The newly remodeled kitchen has all the comforts of home and then some. It is fully equipped to prepare an elaborate dinner or a simple snack. The dining area has seating for six people, with two additional seats at the bar. There is a separate laundry room in the unit with stackable washer and dryer. Free High Speed Internet Access is included as well! 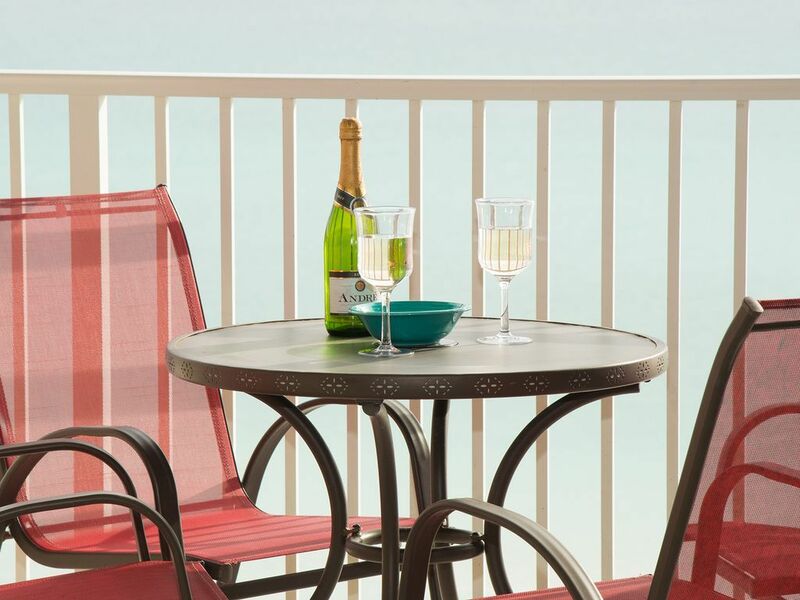 The wide boardwalks provide easy beach access and the complex is conveniently located close to the Emerald Coast Convention Center, the Okaloosa Island Boardwalk and Fishing Pier. A number of excellent restaurants can be found walk or short drive, as well as other local attractions such as theme parks, mini golf and go-carts. The shopping is beyond belief with the USA s largest designer outlet mall only fifteen minutes away with other major shopping areas even closer. This is truly a family destination resort with more than enough activities available to keep everyone entertained for a week or more. Condo #704 was beautifully decorated and in excellent condition. The view from the 7th floor was awesome! Planning the vacation was a breeze due to the efficiency of the VRBO team. Very nice condo. Comfortable beds and large TVs. Would stay here again!! Great view!! Enjoyed this property tremendously, been coming to this area for 40 years, one of the best places we evere stayed. When we arrived main tv was not working, owner immediately rerplaced it. Plenty of room for six people and three kids. Easy access to the beach from the second floor, great parking. Hope to get it next year as well. We really enjoyed the condo and our stay. No complaints about anything. We’ve been to the Destin area several times and this was the best rental place and location we’ve stayed. We had 6 in our family and it worked out great. We’d definitely stay here again. Beach access was easy and very convenient. Direct view of the beach and ocean from condo balcony. We loved it. Thank you. We had a great time. Condo is in a wonderful location - Close to the beach. Will miss that view everyday! The condo was pretty and had everything you needed for your stay. Easy access down to the beach and pool. Great view of the ocean. Loved having the beach chairs and umbrella provided (one less thing to worry about taking to the beach). We loved having the box fans!! We sleep with a box fan at home, and these were a sweet surprise to have. Favorite place to eat was Stewby’s Shanty. Well worth the drive! And Bippy for ice cream (charged by cup size, not weight). Only gave 4 stars due to the balcony. It was the only thing that was kinda yucky. Not sure what you could to do to clean it though. We just wore our flip flops out, no biggie at all. This is a very lovely condo and place to stay.